You gave to feel sorry for poor Grenache. It has an identity problem and very rarely gets any billing.This grape is a little wild and some times you don’t even know when you are drinking it. 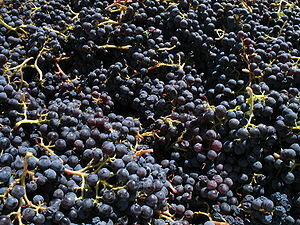 Grenache Noir, as it is known in France is called Granacha Tinta in Spain. It can also be called Cannonau in Sardinia, Alicante in some parts of France or Aragon, Aragones in Spain. Grenache can be called Lladoner, Uva di Spagna, Tentillo, Tinto and Bois Jaune. Garnacha Tintorera is not Grenache at all. Garnacha Tintorera is really Alicante Bouschet, which is not the same grape as plain old Alicante. You see the identity problem. Grenache is either first in acreage planted or comes in second in the world depending on the source consulted. However, Grenache however is not as widely planted around the world as Cabernet Sauvignon. Grenache needs to have a long warm growing season. So, many wine regions around the world cannot grow Grenache successfully. For those of you who do not care about the geek stuff,pass over this paragraph. Galet lists some 362 clones of Grenache, which can have implications on quality and yield. Grenache will oxidize easily if not treated well in the winery and then will not age well. 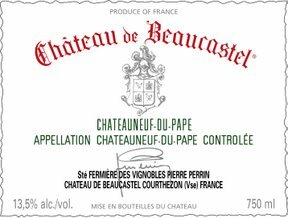 Treated properly, it will age well; some of the Chateauneuf de Pape will age for years. Grenache works well with goblet style pruning and poor well-drained soils. Grenache buds early but needs a long growing cycle to ripen properly. The yields need to be kept low to attain quality. It also suffers from coulere and downy mildew. For those of you who do blind tasting, Grenache is light in color but high in alcohol which is unusual and add in the lower acidity, this helps identify Grenache. It shows more red fruit and white pepper than it common blending partner, Syrah with its black fruit and black pepper. Grenache is all about strawberries, pepper, roasted nuts and spice. It is a low acid grape and has moderate tannins, but still a little on the wild rustic side. Then as it seduces you with its lovely fruit, it can whack you on the side of the head with its possible production of high alcohol, up to 16% and intoxicating delight. Something like a bad girl friend, I suppose. Defiantly not as refined and elegant as a Merlot, but oh ,so much more fun. Grenache gets hidden away, with many different wine styles using it; again with the identity problem. It is used in those wonderful Tavel roses for a brunch sipper, the big dry reds from the Rhone, and also in the fortified wines of Banyuls. I have known people that have developed an addiction to Banyuls and chocolate. I have received phone calls late at night, asking if I have a bottle stashed away somewhere. Poor souls. Be careful of those seemingly carefree Tavel roses as well, a big alcohol punch hidden in the fruity strawberry flavors. Grenache rarely gets the big label billing that a Cab or Merlot can get. In the old world it hides away on the AOC regional label. The Cote de Rhones from France must have a least forty percent Grenache. The wines from Roussilon also have some in its blend and also shows up in Vin de Pays through out southern France. The Spanish who have grown it for about eight hundred years, hide the name, under the regions of Priorat with their almost black wines with huge amounts of alcohol, blend it in Rioja and use it in Navarra with their roses. The great Spanish wine Vega Sicilia uses Granacha as part of it blends, a big wonderful wine. Too bad the bank account shudders when this one is brought home. At the other end of the spectrum, in California’s Central Valley they can beat it up with over yielding vines and use it in jug wines. Bonny Doon and Alban can show it well with their do to low yields and care and attention. Australia again uses it as a blend with GSMs (Grenache, Syrah and Mourvedre) look for Penfolds and D’Arenberg. Grenache is Australians big secret ingredient. That Shariz you have been drinking probably has a little Grenache in it. Chateauneuf de Pape does it the best by far. Grenache is one of the main red grapes of the thirteen permitted in the AOC. Vieux Telegraphe and Chateaux Beaucastel are at the top end but use different amounts of Grenache in their blends. At their price point they are so much better than cult Cabs. Look for Cote de Rhone and Gigondas and Vacqueyras at lower price points, but very good quality. It is hard to make a generlization on food pairings and Grenache as it comes in many styles. Banuylus as mentioned before, think of chocolate desserts. The Roses are great afternoon or brunch wines. The Rhone Valley think of roasted or ‘ barby ‘meats. This weekend forget the Cabernet Sauvignon and the Merlot. Get a bottle of some form of Grenache preferably a Southern Rhone. Call your significant other, turn down the lights put some music on and indulge a little in something different. If you have the Beaucastel, I will not be held responsible for what happens. If you liked this or the Beuacastel worked, scroll up to the top right hand corner and enter your e-mail and click on subscribe. There are some opportunities to taste Grenanche coming up in Vancouver. The ladies from House Wines have a tasting coming up November 9th which they are calling an Ode to Grenache. Check out our post last week on the House Wine Tastings .www.housewine.ca . Marquis Wines is doing a dinner at La Gavroche, November 10th,called Wines of the Rhone Valley. By the way you can pick up the Beaucastel and the Vieux Telegraphe at Marquis. http://www.marquis-wines.com. This entry was posted in Chateauneuf-du-Pape, Garnacha, Grenache, rhone wines, wine tasting, WSET and tagged Bonny Doon Vineyard, Cabernet Sauvignon, Chateaux Beaucastel, Cote de Rhone, Drink, Food, France, Grenache, House Wines, Merlot, Wine, WSET. Bookmark the permalink. It is good that we talk about the Grenache and as long as we do it it is good. I disagree that Grenache is light in colour. Not if you look into the vintages of 2009 and 2010. Grenache is specific Southern Rhone. Northern Rhone based on almost only Syrah with sometimes a percentage of white grapes included. Grenache was once the most widely spreaded grape on the planet and certainly arround the mediteranian. No mentioning of the White Grenache and the “Grenache gris”. Certainly wines for aging, this counts for red as for white. To be mentioned that southern Rhone makes one distiction more in the A.O.C . You have Cote du Rhone, most generic AOC, than you have 18 villages carrying the A.O.C “Cotes du Rhone Villages” ( Seguret, Sablet…) rules more strict , quality should go up, and than are comming the areas that can carry the name of the proper village or area , plain, on the label, Like Chateauneuf, Gigondas, Tavel, lower yield per acre so more concetrated wine. The surface of Chateauneuf du Pape is 7000 acres and you find about 350 wineries. look on http://www.rhone-wines.com for all further information about Rhone wines. Good comments Mike. You are correct, I should have said lighter in color than some of the other varieties ,not light in color. My intent was to get the readers to try Grenache as something new, instead their usual Cabernet and Merlot. The post intent was to give them some very basic information of where and what to look for. In our market Grenache is not very well known at all. I enjoy personally the white wines from Chateuaneuf, and the Rhone, but there are not many available in our market. There was just not enough space to cover the other versions of Greanche. I will do a post some time on the white grapes from the Rhone. Hopefully after trying Grenache or a Grenache blend, the readers will want to explore the other options. and learn about the regions and producers. Thank you for the information and links on the Rhone Valley .For my readers Mike is based in the Rhone Valley and does wine tours in the region. If you are going to the region you should talk to Mike. Mike also has done a webinar for the French Wine Society on the Rhone region and is an expert in Greanache and the other grape varities in the Rhone and Chateauneuf du Pape.